Should "black" be a gummi bear color? This bear thinks so. 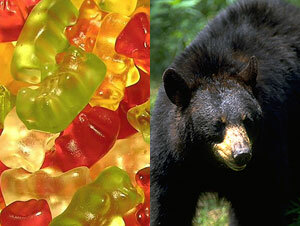 There are red, green, yellow, orange and clear colored gummi bears, but a color not represented in the candy's spectrum of offerings -- black -- presented itself in the form of a black bear, that wanted the yummy gummi bears (and maybe more) being eaten by a two-year-old Pennsylvania toddler. According to the Lehigh Morning Call, a group of Monroe County children were playing outside when a 150-200 pound black bear approached the kids and in particular a two-year-old who was eating the gummi bears. A nearby neighbor saw the bear and ran out of his home with a handgun and fired a warning shot that initially backed the bear off, but moments later, the bear started for the toddler again. A second shot had the same effect. Finally, a third shot, aimed more closely towards the bear's general direction, prompted the bear to run away into the woods. No one was injured in the incident (including the bear) and PA Game Commission Officials were able to find the bear in the nearby woods and chase it farther away from the town. You can read the entire account of the incident from the Lehigh Morning Call here.